LightspeedST: 3. The Mechanics of SpaceTime (ST), copyright 2012, Reginald Brooks. All rights reserved. Lightspeed (* http://en.wikipedia.org/wiki/Speed_of_light) is both accomplished…and fixed…by the very nature of space-time, ST. ST as a whole is composed of individual quantum ST units pulse-propagating into…and out of…our reality space and time. Each ST quanta pulse-propagates at a rate (frequency, v) and extension (wavelength, λ) according to its energy. It is exactly fractal-similar to the relationship of wavelength to frequency found in c=λv, where c= speed (velocity) of light. It is fractal-similar because it…that is, the formation of ST…is a fractal of the formation of the photon, the chargeless-massless-spin1 ST particle of light that is the exchange particle of electromagnetism. From the photon’s point of view, you…the photon…travel over this dynamically formed pulse-propagating ST units one full step per pulse. As this is your only means of travel, you make the best of it. Each step of your travel is across, one at a time, each ST unit pulse-step…its size (λ) and rate (v), based on its energy, form the basis of your c=λv relationship. From the pulse-propagating ST unit’s point of view, you…the ST unit…are formed from the local energy density. That local energy density is but a tiny bit of the overall pervasive energy pool…part of which exist “above ground” in our reality space and time, and, part (perhaps a vastly larger part) that exists “below ground” in the inaccessible (for us) other reality space. Let’s call our reality space as +ST, and the other -ST, space. So, from your local energy density, you begin your pulse…propagating over a bit of time…your extension. Your complete extension will cover your energy-designated λ and the time-covered (generated, really) will be at the proportional energy-designated v, such that c=λv. That’s right, you form a +ST unit at light speed and a photon moves…indeed, always and only moves…at lightspeed because its formation and movement is a direct fractal representation…manifestation, really…of the +ST unit formation. Photons (and gravitons and any other massless, changeless particles) strictly obey the universal constant velocity of light c=λv=3x108 m/s because they are simple reflecting the rate and extension of +ST unit formation. Light travels at lightspeed because ST is formed at light speed. A photon…and the graviton, which is nothing more than the constructive interference of two similarly-orientated spin 1 photon ST units (ɣ0/0/1R + ɣ0/0/1R = ɣɣ0/0/2R and ɣ0/0/1L + ɣ0/0/1L = ɣɣ0/0/2L)…can be thought of as both a disturbance and a reflectance of the processing activity of the +ST unit formation. A disturbance in the larger overall ST field as each of its individual fractal ST units is formed, it creates a local shift in the energy density in that spot of the neighborhood…a disturbance that is not only formed in and of the Inverse Square Law (ISL) through the Euclidean Geometric, fractal-templates of π, √2 and ϕ and the whole Brooks (Base)Square (BBS) matrix grid that ensues…and that local shift in energy density further spans out to other local ST units in a manner consistent with the ISL. When those photon-ST unit disturbances become apparent, measurable and certainly when visible, we can see that light is really just a reflectance of ST.
Now, let’s speak for a moment from yet another perspective…that of the overall ST continuum. From this point of view, you…the ST continuum…have as your top mandate: The Conservation of SpaceTime. The Conservation of *Energy is directly linked to your Conservation of ST because…as you might have guessed…they are two manifestations of the same phenomena…two sides of the same coin. The total energy is composed of all the ST units in their various forms of expression (ST, mass, charge, spin) and the total ST is determined by that same total of energy. The total energy consists of the total ST field and all it’s progeny. Since the total energy can be neither created nor destroyed…and, since all energy comes in Planck (h) quantum units (E=hv, h=E/v and h/2π=ħ=E/2πv)…one can see that the total quantity of ST units (and their progeny expressions of mass, charge and spin), as well as their quality (i.e. energy density), must also remain a constant, equal to the total energy. The Conservation of *Energy = The Conservation of SpaceTime. As the original, singular ST unit divides into a multiplicity of ST units…each carrying 1 Planck quantum unit of energy…that original total energy is parsed out amonst those ST units. Low energy ST units will have great extension, yet occur (pulse-propagate) less frequently than their high energy counterparts whose lack of greater spatial extension is more than made up with their rapid regeneration…all at light speed, c=λv. Back to the ST unit itself. The ST unit and the photon ST unit are essentially the same thing, composed of the same Planck unit of quantum energy that determines their λ and v…according to the local energy density of those Planck units. Both pulse-propagate out their circular forms at lightspeed and collapse back to their core singularity. With each repetitive pulse, they both have the opportunity…because of their spin 1…to travel. They travel exactly the distance of the λ of their formation. If, say, their λ=1 meter and the frequency (pulse rate) v=3x108 cycles/second, then both the rate of formation and the velocity of travel would equal lightspeed as c=λv=1.0 m x 3x108 cycles/second. The formation of ST and the speed of light are the same. And yet, we are left with a dilemma (or two, or three, or…). Photons and gravitons are everywhere for sure. But do they …that is, their total quantity and quality…their total energy…exactly match up to their ST? We can dismiss the gravitons as simply the constructive interference of two similar photons (see above. Incidentally, the Higgs field, as represented by the Higgs Boson is the result of two dissimilar potions destructively interfering such that their two opposing spin 1 orientations cancel out giving rise to the massless, changeless, spin 0 Higgs Boson. Of course, if this Higgs Boson decays, its 0 spin and mass…and is some cases, its charge…status will also change). Perhaps, instead of proposing additional mechanics of generating a photon from each ST unit pulse, the simpler…more eloquent…picture is to see that photons and ST units are, indeed, really the same thing. is formed from the constructive interference of two similar ST units. is formed from the destructive interference of two opposite-orientated ST units. The Photon ST units near perfect symmetry generates two sets of equal, but oppositely pointed formation-vectors that, in this form, cancel out the potential net mass and charge vector expressions. (This is not the case with other ST units displaying net mass and/or charge expression.) A set consist of two formation-vectors together arising from a singularity, separated by a 90°, one in the horizontal, the other vertical, plane. One of these sets arises in +ST, the other…perfectly symmetrical in construction, but not mirrored…arises simultaneously in -ST. Because the two-sets are identical…not mirrored…their circular formation-vectors all point in one of two possible orientations within their respective plane…either right (R) or left (L). As each circular formation-vector contributes 1/2 unit of spin, the net spin of the photon ST unit=1R, or, 1L. The graviton is generated when two similarly-orientated spin 1R + spin 1R photon ST units cross paths. The Higgs Boson is generated when two oppositely-orientated spin 1R + spin 1L, or, spin 1L + spin 1R, photon ST units cross paths. As bosons…which by definition all posses whole integer spins (0, 1, 2, …)…the photon, graviton and Higgs ST units can occupy the same quantum space (disregarding the Pauli Exclusion Principle). The Higgs Boson can decay into two opposite photon ST units. The Graviton boson can decay into two similar photons. The Photon boson can decay, deconstruct, reconstruct and transform into any of the subatomic particles…giving rise to the fourth form that ST units can become. The opposite is also true. Photon ST units are formed when equal and opposite subatomic particles (matter and antimatter) annihilate each other. The question is: Does the Universe contain equal numbers of L- and R-handed photon ST quanta? Another important question is: Is lightspeed conferred onto the interference-generated graviton and Higgs boson…or does this combination of formation-vectors either neutralize or enhance the lightspeed capabilities found in the pulse-propagation of the photon ST quanta? The consequences…both locally and globally across the entire Universe continuum of either of these scenarios…an imbalance in the distribution of L- or R-handed ST unit quanta, and, changes in the lightspeed capability of the interference-generated bosons…would have profound effects on the evolutionary dynamics found within. Since gravitons are only formed with sets of two, similar L- or R- handed photon ST units, their rate of formation…and their role in communicating the energy-dependent curvature of space-time (Gravity)…would be a function of the number of available L- or R- handed photon ST units crossing paths during their pulse-propagating trajectories. It is also possible the L-handed gravitons, once formed, may be selectively biased and favor (or disfavor) similar L-handed ST matter states…be it mass, charge or spin. The same for R-handed gravitons. The situation becomes even more extreme for the formation of the Higgs Boson. In a field skewed with predominantly L-…or predominantly R-…handed photon ST units, their rate of formation would be severely diminished in direct proportion to the number of oppositely-orientated photon ST quanta crossing paths. Such ST fields…high in one orientation type gravitons, low in Higgs Bosons…all from a preponderance of either L- or R- handed photon ST units….may well describe what we are seeing from outside our windows today (yesterday and tomorrow, at least for a while). The scenario that I have often favored is one that sees the graviton and Higgs bosons in a more ethereal way…they are simply the interference pattern that travels and spreads out with the lightspeed photons that generated them. There is no decoupling (collapsing of the waveform) per se, yet one must address the question of what is happening with those formation-vectors that give the photon ST units their lightspeed? Would not even the temporary combinations of opposite formation-vectors…as in the Higgs Boson…lead to differing behavior from that of the similar formation-vectors coming together in the graviton? Would gravitons fly even faster while the Higgs Bosons stall…even temporarily…while the photon formation vectors pass through them? This certainly, especially as other photon ST quanta bombard them should they be held up, would increase both the possibility…and probability…that some manifestation of matter…as mass, charge and spin…would be seeded at these focused points. One flies off to tell the rest of the universe what’s happening here locally, while the other sticks around to accumulate matter from the very ST quanta from which it came. This scenario is, nevertheless, very attractive. NOTE: The Higgs Boson may present with a mass expression ranging from zero (as it is initially formed from the two opposing photons) to a massive mass as it decomposes into elementary and composite particles with mass as the symmetry of the formation-vectors that neutralizes mass expression in the photon ST unit quana is broken. And, finally, in this portraiture of SpaceTime, what about all the other non-boson particles…those with fractional spin (1/2, 3/2, …). These that must follow the Pauli Exclusion Principle and never simultaneously occupy the same quantum state. Collectively known as fermions, they are further subdivided into “light” leptons and “heavy” baryons. The leptons (like the electron and neutrino, as well as their heavier cousins, and all of their antiparticles) are not subject to the strong nuclear force. The hadrons (like the proton and neutron, as well as their heavier cousins, the mesons, and all of their antiparticles) are subject to the strong nuclear force. The strong force itself results from the interplay of the nuclear gluons exchanging color flavors amongst the quarks…the sub-particles of the hadrons. Hadrons, then, refer to both the 3-quark baryons and the 2-quark meson bosons, as composite particles that are subject to the strong force. 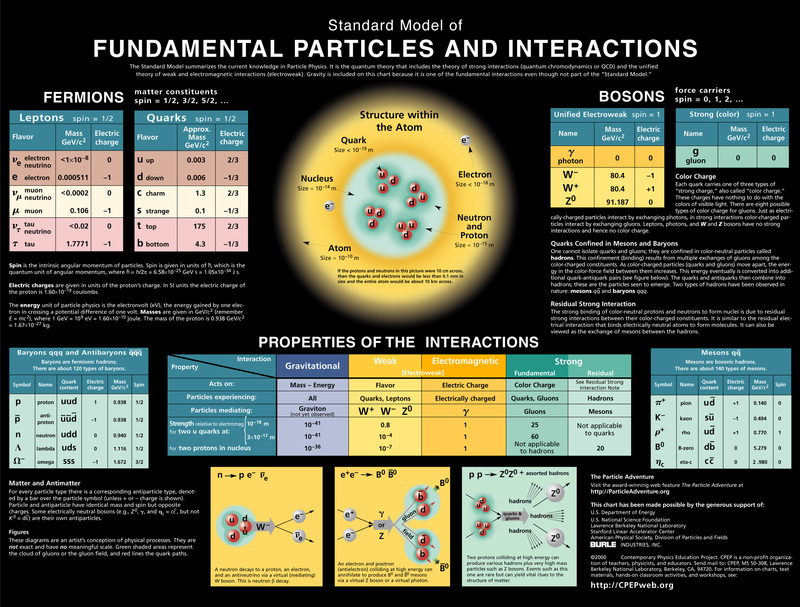 See the Standard Model as well as the Fermion, Baryon, Hadron, Lepton and Quark reference links below. Each of the fermionic ST unit particles is given a mass expression (0 or +), a charge expression (-2, -1, 0, +1, +2 for the particles and fractional charge of -2/3, -1/3, +1/3, or +2/3 for the sub-particle quarks) and, of course, a fractional spin expression (1/2, 3/2,…) by various combinations of photon ST unit formation-vectors. As the Higgs Boson decays (actually, returns) to two photons, each of which may further decay, deconstruct, reconstruct, and thus transform into a particle and an antiparticle set, the resulting particle ST units will all have a net fractional spin and various net mass and charge expressions as described above. They all will, without exception if they contain mass, lose their lightspeed capability. They will become sub-lightspeed ST unit accumulations. With the exception of neutrino/anti-neutrino, all fractional-spin ST units, by definition, have lost their ability to traverse one quantum unit of ST with each pulse-propagation…a built-in requirement for lightspeed. That’s one point. The other point, briefly, is that the list of stable particles is quite short: the electron and its anti-neutrino, the proton, neutron, the up and down quarks, the photon, graviton and Higgs boson, and their corresponding antiparticles. A longer list of unstable particles consists mostly of an additional two sets (a third proposed by this author) of heavy and heavier cousin particles. This begs the question: Are not these imperfect…or at least less geometrically perfect…resonances of the stable particles? Lightspeed is, indeed, but a snapshot, a single-sitting portraiture of a vastly complex, multi-sided personality we call ST. Behind the light, the formation-vectors of simple circular pulses, acting as Euclidean Fractal-Templates of Proportion (π, √2, ɸ), rhythmically generate photon ST unit quanta that may resonate into the higher forms of the graviton and Higgs bosons or slow down, degrading into various incarnations of the baryon (and mesons…not talked about here)…seemingly at the whim of interference, but deep down governed by the Conservation of SpaceTime and the energy that it expresses. The point of this brief exposé on The Mechanics of LightSpeed…A Portrait of SpaceTime is to elucidate a mechanism that accommodates, accounts for and ensures that the speed of light is a constant…under all inertial frames of reference. From the BBS matrix we have shown that the mathematical relationship between all whole integer numbers…and the quantities they represent…and the ISL, form the structural basis of all energy and matter distribution as they inform The Architecture Of SpaceTime (TAOST) itself through the fractal deployment of proportion and pattern. That π, √2 and ɸ…as irrational numbers of infinity…act as fractals of proportion in the generation of these elemental forms…together their actions form a cohesive, resonating bond both between the forms that they generate and to the infinities from which they came. They are fractals of infinity. It is imperative that the very same formation-vectors giving rise to the photon-ST unit quanta have those same Euclidean Geometric Fractals of Proportion (π, √2, ɸ) found in the circle/sphere (and by extension into the square/cube-rectangle) built into their structure…and they do. The mechanics of formation…the formation-vectors…of the ST-photon units themselves. All are subject to the ISL. What we have been describing here is the fundamental mechanics of lightspeed at the level of a few photon-ST unit quanta. But what happens in the vast seas and oceans of ST across the Universe? What happens when the interference-generated graviton and Higgs bosons interfere with yet other photon-ST unit quanta? What happens when they are hit with thousands of other ST quanta…be it photon-graviton-Higgs bosons or any of the other fermion ST units coming from multiple sources from multiple directions? The secret to the Big Bang, the Inflationary Universe, the cosmic background microwave radiation, quasars, pulsars, neutron stars, black holes, dark matter, dark energy and the Universe at large as ascertained…by both our technological advances and the mindset capable of thinking beyond…by mortal, sentient beings…like ourselves…is beyond the scope of this little paper. But here is a little “big” hint: Symmetry drives the Conservation Laws. Pi(π) drives The Architecture Of SpaceTime (TAOST). The speed of light, lightspeed (c), drives the Conservation of *Energy. AFPFP and BBS will lead you to the wonders of the ISL and their symmetries. Geometry will lead you to it all!